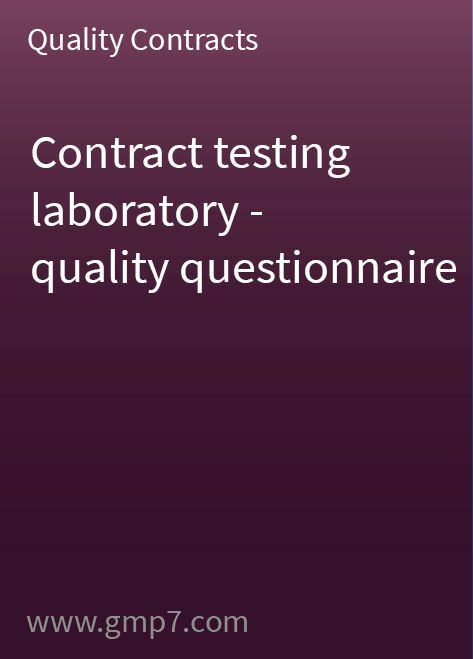 This ready-to-use quality audit questionnaire (audit by mail) has been created to assess potential contract laboratories, to test their quality standards and regulatory profile and reassure your company that the contract laboratory is able to operate in line with current good manufacturing/laboratory practices. The questionnaire also includes a covering letter, which only needs a small amount of site-specific modification before it can be used. During on-site audit preparation work, this checklist can be used to draw up the audit agenda and help with the execution of a systematic on-site GMP audit. Please remember that as long as your company name is on the product to be tested, you are legally responsible for ensuring that the product tests carried out on your behalf meet all quality specifications and comply with all legal regulatory requirements imposed on testing.